I got the idea for these mushrooms on my birthday this year. 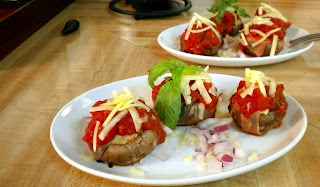 I was trying to think of what I would like for dinner and thought some fancy stuffed mushrooms sounded pretty darn good. I planned to make them for Zo and I but to my surprise Zo sprung a birthday party on me at one of our favorite Basque restaurants with some of my close friends and family. We had a ton of fun and too much and laughed the night away. The mushrooms got to sit in the fridge until the next day when I decided I would make them special for Zo as a thank you meal. They were a real treat and surprisingly very easy to get together and cooked! I hope you enjoy this birthday turned into thank you dish! Mix all filling ingredients together in a medium bowl. Stuff each mushroom until just over filled then wrap each by laying a piece of prosciutto over the mushroom and tucking it under the mushroom making sure to over lap the ends. Place mushrooms into a large olive oiled buttered baking pan and spoon 1 tbsp of marinara over each mushroom. Bake at 350 for 20-25 minutes. Remove from oven garnish with mozzarella and red onions and serve while still hot. Enjoy!